Chiz Escudero first came to the attention of the Filipinos when as one of the youngest members of Congress, he stood out as a charismatic, eloquent speaker with a remarkable facility with the Filipino language. He has risen to prominence when he led an impeachment drive against then President Gloria Macapagal Arroyo. His meteoric ascend to politics saw him a senate seat in 2007. Chiz was born Francis Joseph Escudero on October 10, 1969. He is the second of the three children of the late Agriculture Minister and First District Representative of Sorsogon Salvador Escudero and now congressman Evelina Guevara Escudero. He was educated in the public school system of the University of the Philippines from kindergarten all the way to law school, where he was a member of the debate team. After passing the Philippine Bar in 1994, Chiz went into practice while at the same time took on a teaching position as a law professor at the UP College of Law. In 1996, he obtained a Masters degree in International and Comparative Law at Georgetown Law Center in Washington, D.C. In 1998 he won his first election as the Representative of the First District of Sorsogon at the age of 28. He was re-elected two more times during which he served as Assistant Majority Floor Leader and House Minority Floor Leader. 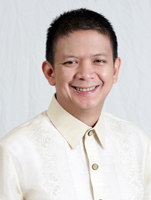 In 2007, Chiz took his oath at the Senate, garnering the second highest number of votes. Once in Senate, he made good of his mandate engaging in endeavors that fulfill his campaign promise to be the "voice of the people" in the Upper Chamber. One of his first efforts was to gain tax exemption and additional exemptions for the low-earners. This law is now what is known as RA 9504 (Tax Exemption for Minimum Wage Earners and Increased Tax Exemptions). He also worked to increase the maximum insurance coverage to P500,000 for bank deposits (RA 9576). At the helm of the Justice and Human Rights Committee, he is responsible for the passage of the anti-vagrancy law (RA 10158), RA 10353 (Anti-Enforced or Involuntary Disappearance Act) and RA 9745 (Anti-Torture Act). In the last 15th Congress, Chiz has a zero backlog in his two committees, Justice and Human Rights and Environment and Natural Resources, having heard and acted upon all the bills filed before both. He was able to pass creation of additional 281 courts, an undertaking meant for justice to be served effectively and efficiently especially to those who are in the countryside. Chiz was named one of the country’s Ten Outstanding Young Men (TOYM) for youth leadership in 2005. In 2007, he was the only Filipino to be named Asia News Network’s Asia’s Idols. He was honored as one of the world’s Young Global Leaders in 2008 by the World Economic Forum. And in 2012, he received the Rotary Golden Wheel Award in recognition of his contributions in political governance and the legislative field. With the fresh mandate given to him in the 16th Congress, Chiz continues to push for extensive legislation on good governance, education, agriculture, electoral reforms and justice and human rights.